Egads! 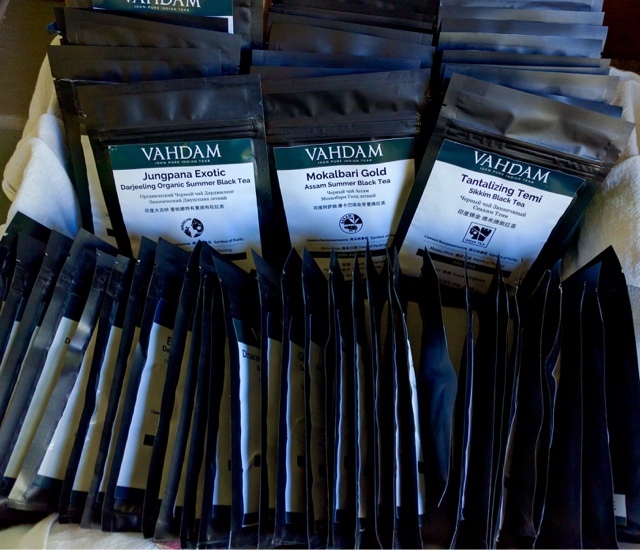 What am I doing with 70 samples of India teas? For various pathological reasons, I have been drinking a lot of subpar bagged English blends in the morning. I fell into a strange dichotomy. Whereas I will spend some serious mental energy selecting, brewing, obsessing over China teas, I treat India teas as a basic commodity like milk that I grab off the supermarket shelves. I cannot reliably start the day without a dark tea- my brain needs something uncomplicated and strong to wake up. China hongchas (imperial dianhongs, lapsang souchong), shus and darker roasted yanchas and oolongs have become too mentally stimulating on a weekday and so I have reverted to India black teas as my morning workhorse tea. I'm not trying to overturn my sinophile bias but I want to put a moderate amount of effort finding a supplier in India for higher quality leaf. 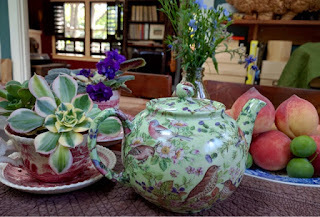 Drinking ageable China teas like puerh reflexively engage my prefrontal cortex from early conditioning. For the first few years of drinking puerh, most sessions became a fatiguing and somewhat frustrating exercise in long term planning. My mind was constantly evaluating aging/hoarding potential of a tea. Even if I want to, it's nigh impossible now to turn my analytical brain off with such teas. But for India teas, I am blissfully immune. Pretty good India teas are readily available so I just drink it and enjoy. I have been recently trying to avoid decision fatigue in the morning in an attempt to simplify my life. Our decision making ability deteriorates with each choice made throughout the day regardless of importance and you don't want to blow your cartridge too early on inconsequential matters. My husband wisely has only two different kinds of socks while yours truly considers socks an integral part of a fully color coordinated outfit and hence I make terrible late night purchasing decisions. A box of 70 tea choices could potentially wreak havoc. However I find that because I am laid back about India teas, I randomly pick something and am generally satisfied. I just keep a booklet of gold stars and smiley stickers in the box to keep track of which teas stood out. 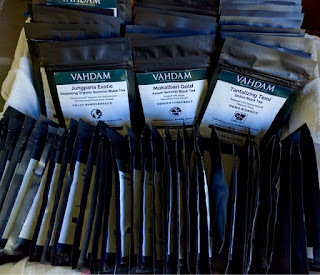 I had planned to try out a different India based vendor like teabox but got lazy and went again with Vahdam/Golden Tips as they carry a much larger selection of samplers. In my second order, I got the summer flush sampler, Assam party pack, a chai sampler, various Earl Greys, and some Nilgiri. The experience has been an altogether a pleasant way to drop a hundo- and really you could not get this kind of variety and quality with China teas for a hundred. Egads! 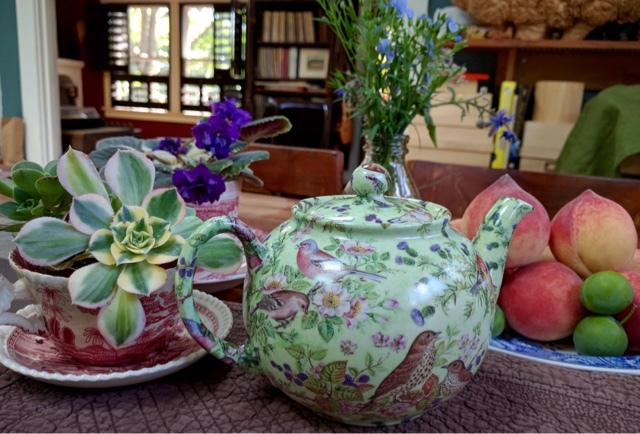 What am I doing with a mass produced slip-cast teapot lithographed with songbirds? It's probably a few decades too early for me to be going in this direction. One late ebay night, I found this English Heron Cross teapot for my husband to commemorate a pair of wrens nesting in our backyard. I excitedly mistook a mating pair of thrushes illustrated on the bottom to be wrens. Even with this misidentification, the husband (a bird lover) could not help but approve this pot after an obligatory interrogation on why we needed another pot. I can recommend an Indian based vendor named "darjeeling express" great range of tea including some high end and some oddities like taiwanese oolong grown in assam.